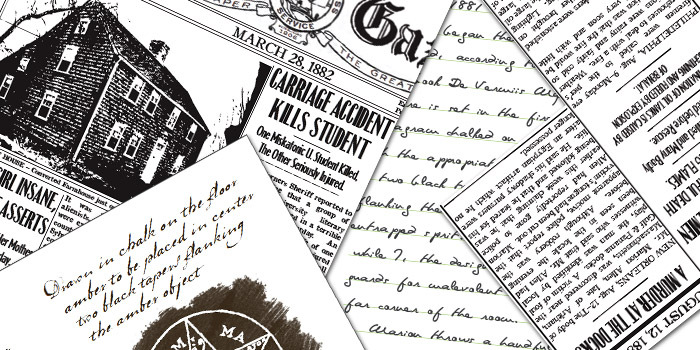 As someone who tries to create beautiful prop documents for Lovecraftian games, one thing I have developed a sharp eye for is attention to detail in historical accuracy. It really is the difference between a “quickly-thrown-together-handout-for-my-group’s-homebrew” and a high-quality art item you’d expect to see in a published book. One thing for which I have also developed a keen sense of is the (small) community of people who aim to create props/handouts to the highest quality. The highest exemplar in this field is the H.P. Lovecraft Historical Society, whose work has been featured in their own products but also in recent releases from Miskatonic River Press. A lesser-known, but similarly excellent, source of high-quality prop documents is the GEEDUNK Props sets produced in 2010 and 2011 by Michael Fanara of Little Ferret Films. 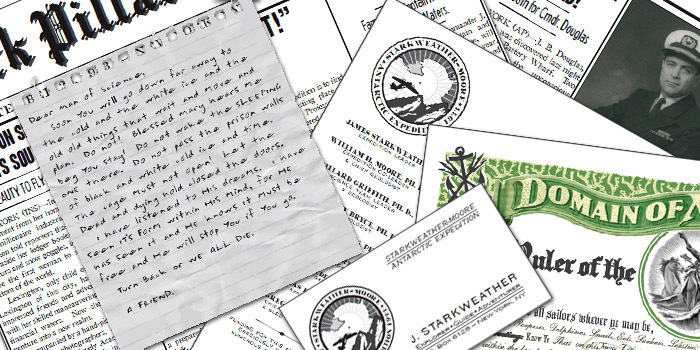 Michael designed a series of prop documents to supplement previously published scenarios, employing very similar templates and fonts as those used by the HPL Historical Society. And, even better, he released these props sets for free. So why haven’t most people heard of the GEEDUNK Props? … Well, the biggest reason is that Michael’s website “went dark” a little over a year ago. This is a great shame, as the GEEDUNK Props represent an amazing resource to Call of Cthulhu Keepers who are looking for some ready-made high-quality props to spice up many of the most-popular scenarios and campaigns published for the game. In the interests of keeping this excellent set of props “in print” and available under their original (Creative Commons) license, Cthulhu Reborn have decided to create a mirror site for the GEEDUNK Props. This isn’t intended as an attempt to claim these fantastic props as our own … but rather a means to keep them available to the community. We hope that by making these resources available, Call of Cthulhu gamers will continue to enjoy the fruits of Michael’s considerable efforts … and maybe it might also inspire other prop-makers to aim for the same level of quality when designing their own props. Click here to go to the mirror and take a look. This entry was posted on Sunday, September 22nd, 2013 at 8:37 am	and posted in News & Updates, Prop Elements. You can follow any responses to this entry through the RSS 2.0 feed.